SBM has produced several thousand Low Intensity magnetic separators both dry and wet versions to the iron ore and others mining industry. SBM has (in close co-operation with the iron ore mining Industry) developed and designed the low intensity magnetic separators to meet the highest demands for capacity, metallurgical performance and mechanical availability. The range of wet magnetic separators is composed of the series WS1200 with drum diameters of 1200 mm with a magnetically effective drum length up to 3678 mm in increments of 613 mm. The WS1200 series includes concurrent, counter-current and counterrotation tank designs. 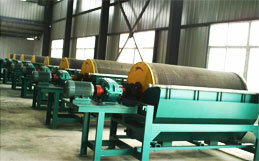 The wet magnetic separators are primarily used for cobbing, roughing, cleaning and finishing purposes. Concurrent and counter-current separators are designed for both single and multistage arrangements. 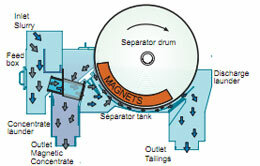 The heart of the magnetic separator is the magnetic drum assembly which is composed of a stationary magnetic array mounted inside of a non-magnetic drum. During operation, the drum revolves around the magnetic assembly thereby transporting magnetically attracted material on the drum to the area designated for discharge. The drum heads are normally cast from nonmagnetic aluminium alloy and the drum shell is manufactured from non-magnetic stainless steel. Drum shells are normally rubber or stainless steel covered against abrasion.